This article provides complete information about Mysore Palace, Mysore, India. The city of Mysore is Karnataka's City of Royals. More specifically, these royals were of the Wodeyar (sometimes spelled as Wadiyar) dynasty. Their residence: the Mysore Palace, today one of the world's famous tourist spots. For the historically inclined, here is a little background information on the Mysore Palace: Way back in the fourteenth century, the palace was not a grand palatial home but more like a fort. Some time during the early 1600s, the lightning bolts resulting from the fury of the nature Gods practically destroyed the fort. King Kantirava Narasa Raja Wodeyar commissioned its restructuring with some extensions. In the 18th Century there were huge political upheavals following the death of King Chikka Devaraja Wodeyar. Subsequently, when Tipu Sultan attacked the kingdom he demolished the structure entirely and became the ruler of Mysore. In the following years, time and again the structure was re-built and neglected. Finally, in 1912 British architect Henry Irwin was given the great task of reconstructing the palace by Queen Regent Kempananjammanni Vanivilasa Sanndihana. 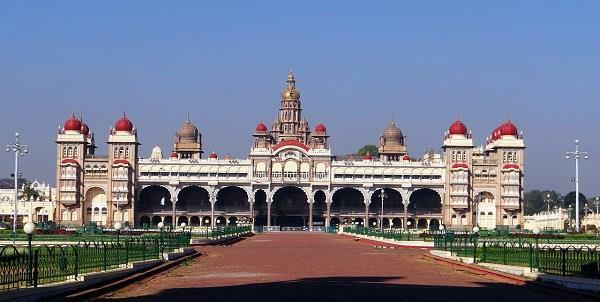 It is this beautiful Mysore Palace that attracts visitors from all over the world. What attract these visitors are the architectural features. The three-storeyed Mysore Palace made from stone and granite has exquisite grey marble domes with pink hues and a massive five-storeyed tower with its golden dome rising towards the sky. Irwin had incorporated creative design styles from a variety of Indian architectural forms, including the Mughal and Rajput royal eras and those of the South. Gothic styles are also seamlessly blended in. At the very front of the Mysore Palace, seemingly guarding it, is Gajalakshmi, the goddess of wealth & prosperity, and her herd of elephants ('gajini' means female elephant in Hindi). Altogether seven arches dominate the façade, making an impressive picture. The grandeur continues inside, as you step over the threshold to be greeted by a truly regal sight – majestic columns, intricately carved doorways and the doors themselves and large pavilions. Wherever you look, you will see detailed frescoes that relate the stories of ancient Indian epics. Don't forget to look up too! Breathtaking chandeliers are reflected in the stained glass panes embedded in the ceiling. The first room that you enter through the main facade is the Gombe Thotti or the Doll's Pavilion, so-called because of its interesting collection of dolls of the previous two centuries. You cannot overlook the presence of the 7 canons that are actually functional even today. In fact, they are fired to mark the opening and closing of the famed Dassehra procession. Speaking of canons, you should definitely not miss out on the collection of armoury that dates back to the 14th Century. It is housed in the Ayudhashala (Royal Armoury) pavilion. While this is on the upper floor, a pavilion on the ground floor displays royal jewellery and regal costumes. Then there is the Kalyana Mantapa (marriage hall). This pavilion displays the peacock symbol everywhere, including on the tiled floor. The most grandiose room in the Mysore Palace, though, is the Ambavilasa or Diwan-e- khas. This is not just a room, but actually a huge hall in which the King would have meetings in private with his ministers and guests. If you get a hint of an exotic fragrance in the air, don't be surprised – it emanates from the rosewood door. You will be stepping on to a glittering floor that sparkles with semi-precious stones. If the public wished to meet the King, he granted them an audience in the Public Darbar Hall, which displays splendid paintings of famous Indian artists. Besides the rooms, there are a dozen temples and beautifully maintained gardens within the Mysore Palace complex. Don't forget to see the royal throne! This majestic regal seat can be viewed by the public only during the Dassehra Festival. Mysore Palace is well known and everybody can give you directions to locate it. It is located at the city center, within a few footfalls of the Mysore City Bus Stand and barely a couple of kilometres from the Mysore City Station. You are probably wondering why there is no road or street name in the postal address! Mysore Palace is not only a very popular place in the city of Mysore, but is itself a landmark of the city. Hence, the name Mysore Palace is itself a complete address. In fact, although postal pincodes are considered vital on locating incomplete addresses, you can be sure your postal correspondence will reach Mysore Palace just with its name (do mention the country India if you are sending it from abroad). The city of Mysore is easily accessible by air via major cities in India. It is also connected by train with numerous cities and by road with other cities in Southern India via Bengaluru (Bangalore). Once you are in the city of Mysore, you can travel around by a rental car which you can hire through your Hotel. Another mode of local transport in Mysore is the auto rickshaw, which you pay by the meter. However, note that the auto rickshaw driver will more often than not hassle you for higher rates. In fact, at night after 10pm you will likely pay 50% more than the meter reading and practically double after midnight. So be ready! Mysore at present does not have an Airport, although work was under way to upgrade the Mandakalli Airport near the city. You need to fly in to the Bengaluru International Airport, which is the closest airport to Mysore. From here, you can either take a train or travel by road. You can take a train from any of the metro cities – Mumbai, New Delhi, Chennai and Bengaluru (Bangalore). From Bengaluru it is the most convenient. There are daily passenger trains to and fro between the two cities at convenient timings beginning from early morning. The Mysore Palace is about 3kms from the Mysore City Station. The National Highway NH-212 connects Mysore to the town Gudlupet, and from there you are connected via roads to Kerala and Tamil Nadu. The best option is to travel from Bengaluru to Mysore via State Highway 17. It is approximately 3-4 hours to Mysore Palace. The most economical option to travel to Mysore from Bangalore is to board an air-conditioned Volvo Bus that departs from the Karnataka Road Transport Corporation (KSRTC) City Bus Stand. The buses depart from here at regular 20 minute intervals to the Mysore Bus Station, which is just 1 km from the Mysore Palace. The Mysore Palace is open to the public for 7 ½ hours everyday. However, you cannot view the Royal Throne in the Mysore Palace except during the festival of Dassehra, which is generally in the month of October. The palace is illuminated on Sundays, as well as National Holidays (such as Independence Day, Republic Day, etc) and State Festivals from 7:00 p.m. to 8 p.m. During the Dassehra Festival the Mysore Palace is illuminated between 7 p.m. to 9 p.m.
Tickets to the Mysore Palace are very nominal. INR 10/- for school students. Note: Tickets can be bought only at the entrance of the Mysore Palace. Do not buy tickets to Mysore Palace from any touts anywhere in the city. 1. Photography is strictly prohibited inside the Mysore Palace. You have to deposit your cameras to the Palace staff at the entrance. 2. You are not permitted to wear any kind of footwear inside the Mysore Palace. You have to leave your footwear at the entrance. 3. Please do not take eatables inside the Mysore Palace. 4. Please do not make graffiti anywhere. 5. Please do not spit anywhere. The first two are official rules for visitors to the Mysore Palace. The other rules apply too naturally – it is basic good manners & etiquette! Additional Information about Mysore Palace: While you wander around the Mysore Palace, if you wish to get proper information about the various rooms and exhibits on display, you can hire the services of a local guide at the gates. The guide's fees will be approximately INR 200/-. Most families plan their vacation around their kids' school summer holidays. However, if you are planning to visit Mysore, it is a good idea to center it on the days of the Dassehra Festival of India, usually in October. Make sure you are there on the final day of Vijayadashmi! The regal seat of the Wodeyar Royals is called the Chinnada Simhasana or Ratna Simahasana in the local language Kannada. It is housed in their residence – the Mysore Palace. While you can explore the Palace all-year round, it is only during the Dassehra Festival that the Royal Throne is re-assembled and put on display for public viewing. The royal throne was designed from 200kgs.of pure gold – just imagine all that gold in one piece! The exact historical background of the royal throne is not known, but it is said that it first belonged to the Pandavas, then was brought to another city and finally came to be used as the royal seat of the Vijayanagar Kings. The Wodeyar dynasty was handed over the throne apparently in the early or late 1600s. The Royal throne is not just a single seat. It has a couple of steps with balustrades that lead up to the seat and an umbrella (also made of gold) over the seat. The basic material used to create the throne was figwood, which was then beautified with ivory. The entire throne glitters not just from the gold incorporated in it, but also from the numerous precious stones, jewellery pieces and silver carvings. Even the balustrades gleam with figurines! The throne is blessed by the Hindu Trinity of Gods: Brahma (the Creator), Vishnu (the Preserver) and Shiva (the Destroyer). Each side of the throne is guarded by different entities – chariots (north), horses (south), elephants (east), and soldiers (west). The golden umbrella overhead has slokas that refer to Krishnaraja Wadiyar III as the ruler of the planet. As a reflection of the bygone royal processions, every year a procession of caparisoned jumbo elephants is taken out on Vijayadashmi day during the Dassehra Festival. It begins at the Mysore Palace. The idol of Goddess Chamundeswari is seated in the golden howdah mounted on an elephant specially selected for the honour. The over 700kg howdah (84kg is pure gold) can be viewed at the Mysore Palace in the Gombe Thotti (Doll's Pavilion). Folk dancers and large tableaux are additional attractions of the procession. Srikantadatta Narasimharaja Wadiyar, the current scion of the Wodeyar Dynasty, is the special guest. The procession generally covers a 5-km route through Chamarajendra Circle, K.R. Circle, Sayyaji Rao Road, Ayurveda College Circle and Highway Circle. It ends at the Torchlight Parade Grounds. The torch-light parade near Mysore Palace is called Bannimantap. It is the grand finale of the Dassehra Festival, organised on the last day which is Vijaydashmi. Sets of Colourful and unusual fireworks are set off at the Torchlight Parade grounds. Generally, there is also a display of daring stunts presented by Indian Army soldiers. (a)You can buy tickets for the Torchlight parade from the Mysore Urban Development Authority, the Mysore City Corporation office, or at any Tourist Information kiosk in the city. (b) Vijaydashmi 2010 is on Sunday, October 17th 2010. So what are you waiting for? Plan your trip to Mysore Palace right now, well in advance!